This is an extract from the series 1 OS 6″ (1:10,560) mapping made available by Landmark Information. They have made this scale of mapping available free (for non-commercial use), more details available on the old maps website. The Cambridge-St Ives railway line can be seen clearly crossing the map. 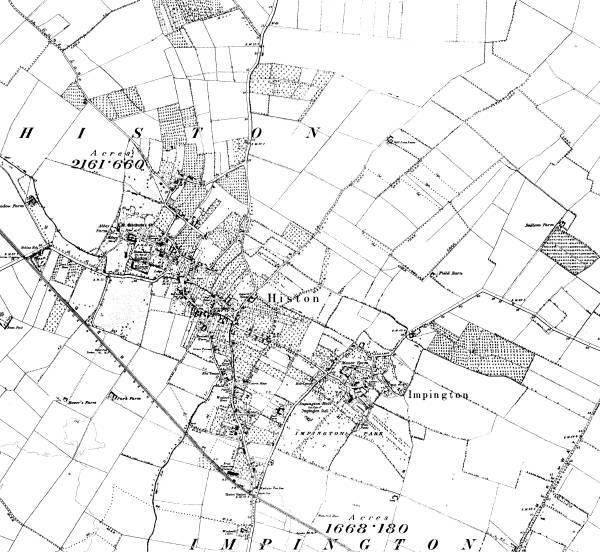 The Impington Mill (marked “corn”) is just above the “M” in Impington. Whilst the general shape of the villages is visible, much of that is fields and orchards. Note that there is no development in Impington south of the railway line, and the whole of the Histon Manor Park area is also still open fields. This image is a subset of a collage from 6 tiles downloaded from the Landmark site, then reduced.